Objective To assess the comparative efficacy and safety of candidate agents (low and high dose aspirin, non-aspirin non-steroidal anti-inflammatory drugs (NSAIDs), calcium, vitamin D, folic acid, alone or in combination) for prevention of advanced metachronous neoplasia (that is, occurring at different times after resection of initial neoplasia) in individuals with previous colorectal neoplasia, through a systematic review and network meta-analysis. Data sources Medline, Embase, Web of Science, from inception to 15 October 2015; clinical trial registries. Study selection Randomized controlled trials in adults with previous colorectal neoplasia, treated with candidate chemoprevention agents, and compared with placebo or another candidate agent. Primary efficacy outcome was risk of advanced metachronous neoplasia; safety outcome was serious adverse events. Data extraction Two investigators identified studies and abstracted data. A Bayesian network meta-analysis was performed and relative ranking of agents was assessed with surface under the cumulative ranking (SUCRA) probabilities (ranging from 1, indicating that the treatment has a high likelihood to be best, to 0, indicating the treatment has a high likelihood to be worst). Quality of evidence was appraised with GRADE criteria. Results 15 randomized controlled trials (12 234 patients) comparing 10 different strategies were included. Compared with placebo, non-aspirin NSAIDs were ranked best for preventing advanced metachronous neoplasia (odds ratio 0.37, 95% credible interval 0.24 to 0.53; SUCRA=0.98; high quality evidence), followed by low-dose aspirin (0.71, 0.41 to 1.23; SUCRA=0.67; low quality evidence). Low dose aspirin, however, was ranked the safest among chemoprevention agents (0.78, 0.43 to 1.38; SUCRA=0.84), whereas non-aspirin NSAIDs (1.23, 0.95 to 1.64; SUCRA=0.26) were ranked low for safety. High dose aspirin was comparable with low dose aspirin in efficacy (1.12, 0.59 to 2.10; SUCRA=0.58) but had an inferior safety profile (SUCRA=0.51). Efficacy of agents for reducing metachronous colorectal cancer could not be estimated. Conclusions Among individuals with previous colorectal neoplasia, non-aspirin NSAIDs are the most effective agents for the prevention of advanced metachronous neoplasia, whereas low dose aspirin has the most favorable risk:benefit profile. Colorectal cancer is the third most common cancer worldwide,1 with annual healthcare costs in the United States alone estimated to be over $14bn (£11bn; €13bn).2 Over 85% of sporadic colorectal cancers arise from advanced adenomas.3 Colonoscopic screening with resection of adenomatous polyps has been associated with a reduction in mortality, and this is the preferred approach for preventing sporadic colorectal cancers.4 5 Unfortunately, suboptimal adherence, access, and expense limit population-wide adoption of preventive colonoscopy.6 Additionally, despite routine screening, a few individuals still develop colorectal cancer before their recommended surveillance interval, either because of missed or incompletely resected polyps or rapidly growing tumors.7 8 Given the limitations of screening tests and poor prognosis associated with advanced stage colorectal cancer, there is great interest in exploring chemoprevention strategies to reduce the burden of this preventable malignancy. Many commonly available nutritional supplements and pharmacological agents have been studied as chemoprevention agents for colorectal cancer in people with previous colorectal neoplasia, with variable efficacy in randomized controlled trials.9 10 11 12 13 14 15 16 17 18 19 20 21 22 23 Meta-analyses have suggested that aspirin and non-aspirin non-steroidal anti-inflammatory drugs (NSAIDs) could be effective in decreasing the risk of advanced metachronous neoplasia (that is, occurring at different times after resection of initial neoplasia),24 25 26 but in the absence of head-to-head trials, their relative efficacy and safety are not known. Pairwise meta-analyses provide only partial information in this case because they can answer questions only about pairs of treatments and do not therefore optimally inform decision making. 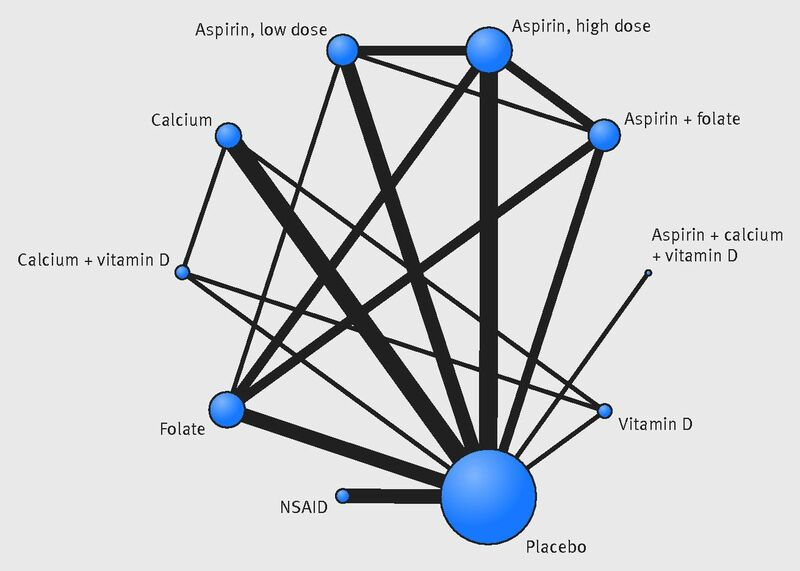 Network meta-analyses combine direct and indirect evidence to establish comparative efficacy and safety across a network of randomized controlled trials of all agents used in a particular condition; such an analysis assumes the trials are conceptually similar with regard to design, participants, intervention (dosing, duration), co-interventions, and outcome assessment.27 28 This technique can improve the precision of the estimate (compared with direct evidence alone) and also allows estimation of the comparative efficacy of two active treatments, even if no studies directly compare them.29 Such comparisons with a quantitative synthesis of risks and benefits of all candidate chemopreventive agents can inform patients, clinicians, policymakers, and other stakeholders regarding the optimal use of these agents in clinical practice. A medical librarian designed and conducted the search strategy with input from study investigators, using various databases from inception to 15 October 2015. Using controlled vocabulary supplemented with keywords, we searched for trials of candidate agents for chemoprevention for colorectal cancer. The databases included Medline, Embase, Scopus, Web of Science, Cochrane Central Register of Controlled Trials, and Cochrane Database of Systematic Reviews (appendix 1). In addition, we searched clinical trial registries (www.clinicaltrials.gov, www.clinicaltrialsregister.eu), conference proceedings, and published systematic reviews for additional studies. Two study reviewers (SS, EM) independently reviewed the title and abstract of these studies to exclude any that did not examine the research question of interest. Full texts of the remaining articles were reviewed to identify studies that met all criteria (as detailed below) for inclusion in the quantitative synthesis. Figure A in appendix 2 details the study selection flowchart. Studies included were randomized controlled trials that met the following inclusion criteria: participants were adults (age ≥18) with previous colorectal neoplasia or colorectal cancer who underwent curative resection before randomization; interventions of candidate chemoprevention agents—low (≤160 mg/day) or high dose aspirin (≥300 mg/day), non-aspirin NSAIDs, calcium, vitamin D, folic acid, alone or in combination; comparators were another candidate agent or placebo; and outcome was proportion of individuals who developed metachronous neoplasia, reported as either advanced neoplasia or any neoplasia, on follow-up colonoscopy, within three to five years of the index study related colonoscopy. The primary efficacy outcome was prevention of advanced metachronous neoplasia, within three to five years of the index colonoscopy. Advanced metachronous neoplasia was defined according to the study authors; if this was not clearly defined, it was classified based on presence of a villous component, high grade or severe dysplasia, and/or cancer (neoplasia size or multiplicity were not routinely reported) (table 1⇓). Our secondary efficacy outcome was prevention of any metachronous neoplasia (advanced and non-advanced neoplasia, colorectal cancer). The rarity of metachronous colorectal cancer in the included trials precluded its assessment as an efficacy outcome in network meta-analyses. It is therefore reported narratively from individual trials. Moreover, more than 85% of all colorectal cancers are thought to arise from advanced neoplasia, and estimated annual transition probabilities from advanced neoplasia to colorectal cancer range from 2.6% to 5.2%, in an age dependent manner.39 Hence, prevention of advanced neoplasia is an accepted surrogate for preventing colorectal cancer. To incorporate indirect with direct comparisons, we conducted random effects bayesian network meta-analyses using Markov chain Monte Carlo methods in WinBUGS 1.4.3 (MRC Biostatistics Unit, Cambridge, UK).29 43 44 We assumed “consistency” of treatment effects across all included trials—that is, true treatment effects are on average the same from both direct and indirect analyses—and assumed that heterogeneity was common within networks. Network consistency was evaluated by comparing the direct estimates with the indirect estimates for each comparison, with a node splitting technique.30 We estimated the posterior distribution of all parameters using vague priors to limit inference to data derived from the trials at hand (that is, we made no assumptions about the efficacy of these drugs from data external to the trials included in this systematic review). We changed the precision/variance of the priors in sensitivity analyses with minimal change to the estimates suggesting robust approach. We tested three chains with different initial values and ascertained convergence. We updated our Markov chain Monte Carlo model with 100 000 simulated draws after a burn-in of 10 000 iterations. Multiple chains (that is, multiple initial values) were evaluated for each analysis. The median of the posterior distribution was reported as the point estimate odds ratio, and the corresponding 95% credible intervals were obtained with the 2.5th and 97.5th centiles of the posterior distribution, after adjustment for multiple arm trials. We tested the adequacy of burn-in and convergence (reaching a stable equilibrium distribution) using visual inspection of parameter fluctuation depicted in trace plots, monitoring the Monte Carlo error, and estimating the values of the Brooks-Gelman-Rubin statistic.45 Model fit was evaluated with the total residual deviance, which indicated good fit, if it approximated the number of data points. Finally, to calculate absolute risk reduction, we converted odds ratios to relative risk using the Zhang equation with network meta-analysis summary estimates (odds ratios (OR)) and baseline risks (assumed control risk) obtained from the National Cancer Institute pooling project.48 We used the equation RR=OR/(1−P0)+(Pa×OR), where P0 refers to the risk of outcome of interest in the non-exposed group. The risk difference was calculated as 100×(assumed control risk−OR×assumed control risk)/(1−assumed control risk+OR×assumed control risk). The risk difference, which represents the difference between risks in the intervention and control group, was added back to the assumed control risk to generate an estimate of the absolute risk for each intervention. We generated 95% credible intervals for the estimates using the 95% credible intervals of the odds ratios in the above calculations. Proportions from single arms (placebo) were weighted for each study, and numerators and denominators were added up, to estimate the unadjusted pooled risk of serious adverse events in placebo arms. Estimates of absolute risk were generated with the GRADEpro version 3.6.1 (McMaster University, 2014). Details of the statistical analysis are reported in appendix 1. To assess the robustness of the findings of our primary efficacy outcome we performed multiple sensitivity analyses. These were based on use of colonoscopy surveillance per protocol completer analysis (that is, outcomes included only those individuals who underwent colonoscopy surveillance at the prespecified time period per protocol and excluded individuals who underwent a colonoscopic surveillance assessment before, or after, the anticipated main surveillance interval); worst case scenario assumption wherein patients who did not undergo colonoscopy after randomization were assumed to have developed advanced metachronous neoplasia; exclusion of studies that did not specify for a clearing colonoscopy to occur within at least six months of study initiation; exclusion of studies that limited recruitment to individuals with previous colorectal cancer; and exclusion of studies investigating non-aspirin NSAIDs in combination with other agents (that is, difluoromethylornithine). Additionally, we tested several vague priors in sensitivity analyses to assure robustness of the analysis. We followed the GRADE approach to rate the quality of evidence of estimates derived from network meta-analysis.30 44 49 In this approach, direct evidence from randomized controlled trials starts at high quality and can be rated down based on risk of bias, indirectness, imprecision, inconsistency (or heterogeneity), and/or publication bias to levels of moderate, low, and very low quality. The rating of indirect estimates starts at the lowest rating of the two pairwise estimates that contribute as first order loops to the indirect estimate but can be rated down further for imprecision or intransitivity (dissimilarity between studies in terms of clinical or methodological characteristics). If direct and indirect estimates were similar (that is, consistent) then the higher rating can be assigned to the network meta-analysis estimates. Subsequently, to understand the potential risks of candidate chemoprevention agents, we used the pooled risk of serious adverse event in placebo groups as a measure of baseline risk (fig D in appendix 2). We then used odds ratios derived from the placebo comparisons in network meta-analysis for serious adverse events to estimate absolute risk and anticipated excess risk of serious adverse events (over placebo) per 1000 individuals who receive treatment. This was estimated for the two interventions shown to have the highest probability for preventing advanced metachronous neoplasia based on network meta-analysis. These benefits and risks were then qualitatively synthesized to analyze the relative risk and benefit of candidate agents for the chemoprevention of colorectal cancer. No patients were involved in setting the research question or the outcome measures, nor were they involved in developing plans for design and implementation of the study. No patients were asked to advise on interpretation or writing up of results. There are no plans to disseminate the results of the research to study participants or the relevant patient community. From a total of 3566 unique citations identified using our search strategy, we included 14 randomized controlled trials comparing 10 different interventions.9 10 11 12 13 14 15 16 17 18 19 20 21 22 23 These included 10 two arm trials of candidate agent compared with placebo, one three arm trial of different aspirin doses compared with placebo, and three trials with factorial design (one 2×2 and one 3×2). Figure 1⇓ shows the available direct comparisons and network of trials (for primary outcome of advanced metachronous neoplasia), and figure B in appendix 2 shows comparisons for secondary outcomes. Fig 1 Network of included studies with the available direct comparisons for primary efficacy outcome (advanced metachronous neoplasia). The size of the nodes and the thickness of the edges are weighted according to the number of studies evaluating each treatment and direct comparison, respectively. Table 1⇑ and tables A and B in appendix 3 summarize the randomized controlled trials included in the network meta-analysis.9 10 11 12 13 14 15 16 17 18 19 20 21 22 23 These 14 trials dated from 1999 to 2015 and included 12 234 participants (range 194-2059). All trials were multi-center, double blind, placebo controlled, and 11 studies used a run-in period enrichment strategy to optimize study drug adherence.9 10 11 12 13 14 15 16 17 18 19 20 21 22 23 The median risk of baseline high risk neoplasia in included trials was 44% (interquartile range 23-68); two trials included only patients with previous colorectal cancer.16 22 36 The median initial surveillance period to assess for metachronous neoplasia was 36 months (range 24-60 months) and was before 40 months after randomization for all studies, with the exception of the studies by Sandler and colleagues22 and Benamouzig and colleagues,13 which allowed for surveillance to occur between 36-48 months after randomization, and the study by Baron and colleagues,10 which allowed for surveillance to occur at 36 or 60 months after randomization. The median proportion of patients with family history of colorectal cancer in first degree relatives was 21% (interquartile range 19-32%). The median of average body mass index (BMI) across trials was 27.6 (range 23.6-29.5). Overall, median risk of advanced metachronous neoplasia and any metachronous neoplasia in the participants treated with placebo was 9.1% (range in individual studies 3.2-19.2%) and 43.4% (20.2-62.6%), respectively. On quality assessment, studies of each candidate agent were considered to be at low risk of bias. Though median attrition rate was about 15.6% (range 1.2-30.0), it was similar between intervention and placebo. Moreover, as we used modified intention to treat analysis (including only individuals with at least one colonoscopy after randomization), there were no missing data for the primary efficacy outcome (fig C in appendix 2). Fig D in appendix 2 summarizes results of pairwise meta-analyses. Non-aspirin NSAIDs (celecoxib and sulindac) were associated with a significant reduction in advanced metachronous neoplasia compared with placebo (odds ratio 0.38, 95% confidence interval 0.26 to 0.56). Non-aspirin NSAIDs (0.41, 0.29 to 0.58) and calcium alone (0.69, 0.59 to 0.82) or in combination with vitamin D (0.73, 0.56 to 0.94) were associated with a significant reduction in any metachronous neoplasia compared with placebo. Low dose aspirin was also associated with reduction in any metachronous neoplasia compared with placebo, though this did not reach significance (0.77, 0.58 to 1.01). When we assessed the comparative efficacy of different strategies, low and high dose aspirin alone and in combination with folic acid was superior to folic acid alone for the prevention of advanced or any metachronous neoplasia. Calcium alone and in combination with vitamin D was superior to vitamin D alone for the prevention of any metachronous neoplasia. Overall, the risk of colorectal cancer was 5, 10, and 8 per 1000 individuals treated with non-aspirin NSAIDs and low and high dose aspirin, respectively, compared with 7 per 1000 within study placebo treated individuals. Non-aspirin NSAIDs (odds ratio 1.23, 95% confidence interval 1.04 to 1.45) and calcium (1.40, 1.06 to 1.85) were associated with a significant increased risk for serious adverse events compared with placebo. The addition of vitamin D to calcium was associated with a significant reduction in the risk of serious adverse events compared with calcium alone (0.77, 0.62 to 0.96). In post hoc sensitivity analysis, summary estimates were comparable with the Hartung-Knapp method but with wider confidence intervals (table D in appendix 3). Network meta-analysis suggested that, compared with placebo, non-aspirin NSAIDs were ranked best for preventing advanced metachronous neoplasia (odds ratio 0.37, 95% credible interval 0.24 to 0.53; SUCRA=0.98), followed by low-dose aspirin (0.71, 0.41 to 1.23; SUCRA, 0.67), aspirin+folic acid (0.73, 0.43 to 1.19; SUCRA, 0.67), aspirin+calcium+vitamin D (0.71, 0.18 to 2.49; SUCRA, 0.59), and high dose aspirin (0.81, 0.50 to 1.28; SUCRA, 0.58) (figs 2 and 3⇓; fig E in appendix 2). With an assumed control risk of advanced metachronous neoplasia of 16.3% in patients with baseline high risk neoplasia, the estimated risk of advanced metachronous neoplasia was 6.7% with non-aspirin NSAIDs, 12.1% with low dose aspirin, 12.4% with aspirin+folic acid, 12.1% with aspirin+calcium+vitamin D, and 13.6% with high dose aspirin (table E in appendix 3). When we assessed comparative efficacy, non-aspirin NSAIDs were superior to all other agents for the prevention of advanced metachronous neoplasia, except low dose aspirin and aspirin+calcium+vitamin D, for which the association did not reach significance (fig B). Low and high dose aspirin were comparable with each other for preventing advanced metachronous neoplasia (low dose aspirin v high dose aspirin: odds ratio 0.88, 95% credible interval 0.48 to 1.64). 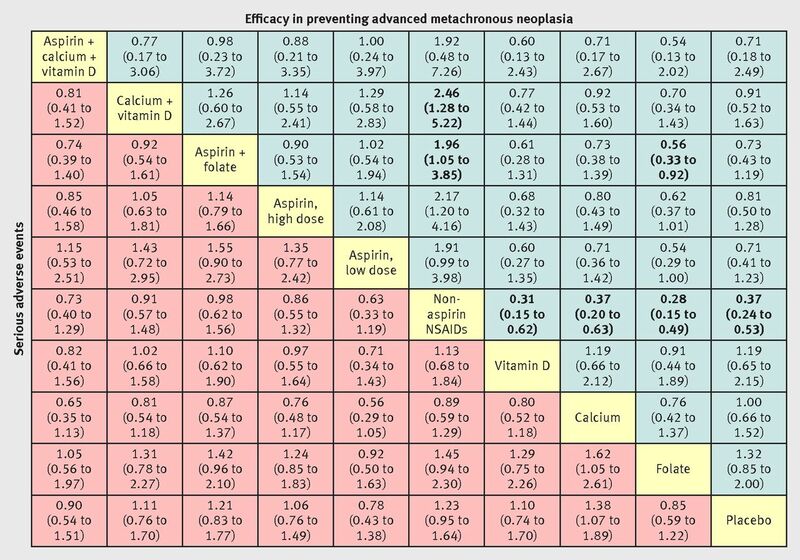 Network meta-analysis suggested that, compared with placebo, non-aspirin NSAIDs were ranked best for preventing any metachronous neoplasia (odds ratio 0.44; 95% credible interval 0.31 to 0.55; SUCRA, 0.99), followed by calcium (0.68, 0.52 to 0.88; SUCRA, 0.70), low dose aspirin (0.69, 0.49 to 0.95; SUCRA, 0.68), calcium+vitamin D (0.71, 0.47 to 1.06; SUCRA, 0.62), and aspirin+folic acid (0.74, 0.52 to 1.03; SUCRA, 0.59). When we assessed comparative efficacy, non-aspirin NSAIDs were superior to all other candidate interventions for decreasing the risk of any metachronous neoplasia (fig E in appendix 2, table F in appendix 3), and low and high dose aspirin were comparable with each other (low v high dose aspirin 0.90, 0.61 to 1.30). Network meta-analysis suggested that, compared with placebo, calcium ranked the lowest for safety (odds ratio 1.38, 95% credible interval 1.07 to 1.89; SUCRA=0.10), followed by non-aspirin NSAIDs (1.23, 0.95 to 1.64; SUCRA=0.26). 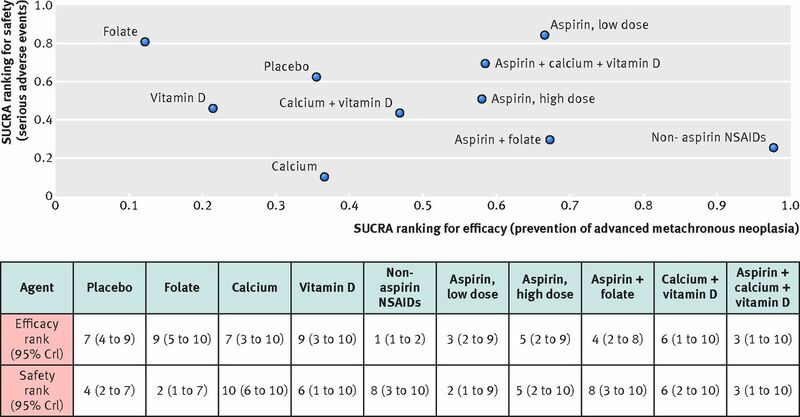 Low dose aspirin was ranked the safest among chemoprevention agents (0.78, 0.43 to 1.38; SUCRA=0.84), followed by folic acid (0.85, 0.59 to 1.22; SUCRA=0.81) and aspirin+calcium+vitamin D (0.90, 0.54 to 1.51; SUCRA=0.69), all of which ranked higher than placebo (figs 2 and 3⇓; fig E in appendix 2). With an assumed control risk of serious adverse events of 18.7% based on pooled event risk in the placebo groups of included trials, the estimated risks of advanced metachronous neoplasia were 22.1% with non-aspirin NSAIDs, 15.2% with low dose aspirin, 21.8% with aspirin+folic acid, 17.2% with aspirin+calcium+vitamin D, and 19.6% with high dose aspirin (table E in appendix 3). Tables F-K in appendix 3 show results from multiple sensitivity analyses. Overall, the results were similar to the main analysis for the primary outcome, and non-aspirin NSAIDs remained superior to placebo when we used per protocol completer analysis (odds ratio 0.47, 95% credible interval 0.20 to 0.88); used worst case scenario assumption (0.63, 0.50 to 0.81); excluded studies that did not specify for a clearing colonoscopy to occur within at least six months of study initiation (0.37, 0.21 to 0.55); excluded studies that limited recruitment to individuals with previous colorectal cancer (0.37, 0.22 to 0.54); and excluded studies investigating non-aspirin NSAIDs in combination with other agents (0.40, 0.27 to 0.60). Results of SUCRA scores were also comparable when we used alternative priors in the network meta-analysis (table L in appendix 3). Overall, there was no serious risk of bias, inconsistency, indirectness, or publication bias for any of the direct comparisons. In several comparisons, there was serious imprecision in summary estimate because the 95% credible interval crossed unity (suggesting the possibility of considerable benefit as well as serious harm in terms of the risk of developing advanced metachronous neoplasia). On applying GRADE criteria to findings from the network meta-analysis combining direct and indirect evidence, we had high confidence in estimates supporting the use of non-aspirin NSAIDs and low confidence in estimates supporting the use of low and high dose aspirin alone or in combination with folic acid compared with placebo for reducing the risk of advanced metachronous neoplasia in individuals with previous resected colorectal neoplasia. There was low confidence in estimates supporting the use of non-aspirin NSAIDs over other chemoprevention agents for preventing advanced metachronous neoplasia. Conceptually, there was no significant intransitivity, with comparable distribution of plausible effect modifiers across trials of different chemopreventive agents (previous advanced colorectal neoplasia, family history of colorectal cancer, and BMI). Tables O and P in appendix 3 summarize the GRADE quality of evidence supporting the use of each candidate chemoprevention agent, compared with placebo and against each other, in individuals with previously resected neoplasia. Based on weighted pooled analyses of placebo arms from randomized controlled trial, we estimated a risk of a serious adverse event of 187 per 1000 placebo treated individuals over three to five years of follow-up. Using risk estimates of serious adverse events derived from network meta-analysis, we estimated an excess of 34 more serious adverse events per 1000 individuals treated with non-aspirin NSAIDs over placebo (compared with 45 fewer advanced neoplasia in participants with previous low risk neoplasia and 96 fewer advanced neoplasia in participants with previous high-risk neoplasia). In contrast, we estimated 35 fewer serious adverse events per 1000 participants treated with low dose aspirin over placebo (compared with 20 and 42 fewer advanced neoplasia in participants with previous low risk or high risk neoplasia, respectively; table 2⇓). As such, participants taking aspirin had fewer serious adverse events and a trend towards a lower risk of advanced metachronous neoplasia. In this systematic review and network meta-analysis, we combined direct and indirect evidence from 14 randomized controlled trials comparing 10 different interventions and reporting on 12 234 participants with previously resected colorectal neoplasia to make several key observations regarding the potential efficacy and safety of colorectal cancer chemoprevention agents. First, non-aspirin NSAIDs (celecoxib and sulindac) are superior to placebo and all other chemopreventive strategies for the prevention of advanced metachronous neoplasia over three to five years, with moderate to high confidence in estimates. Because of the high risk of serious adverse events, however, the excess benefit (of reducing advanced metachronous neoplasia) over risk (of experiencing serious adverse events) might be favorable only in people with previous high risk neoplasia. Second, though low dose aspirin was ranked second in preventing advanced metachronous adenomas with low confidence in estimates, it has the most favorable safety profile, and hence the excess benefit over risk might be favorable for all patients with previous neoplasia (regardless of baseline neoplasia status). Third, though calcium alone or in combination with vitamin D might be effective in preventing any metachronous neoplasia, it does not decrease the risk of advanced metachronous neoplasia, and calcium alone could be associated with an increased risk of serious adverse events compared with placebo. Our study extends findings from primary randomized controlled trials and previous pairwise meta-analyses by systematically synthesizing the entire body of relative and absolute efficacy and safety data for candidate chemoprevention agents for colorectal cancer and by providing an integrated risk:benefit approach to their use in clinical practice. Our findings are in keeping with those from previous systematic reviews regarding the benefit of non-aspirin NSAIDs and aspirin for the prevention of metachronous neoplasia over three to five years.24 25 26 While there was high quality evidence supporting non-aspirin NSAIDs (over placebo) for preventing advanced metachronous adenomas, the quality of evidence supporting the use of low dose aspirin was rated as low, primarily because of imprecision in estimate (a small but not insignificant possibility of harm with increased risk of advanced metachronous neoplasia). Addition of other agents to aspirin (such as folic acid or calcium+vitamin D) does not seem to offer additional efficacy beyond low dose aspirin alone and also does not improve the safety profile of low dose aspirin. Low dose aspirin was also comparable in efficacy with high dose aspirin, while being safer. Non-aspirin NSAID significantly reduced the risk of advanced metachronous neoplasia. In weighing risks and benefits, however, we found that the beneficial effects of non-aspirin NSAIDs possibly outweighed the risks of serious adverse events in individuals with baseline high risk neoplasia. Aside from the short term risk of serious adverse events we observed in our meta-analysis, concerns about long term cardiovascular safety have been raised for non-aspirin NSAIDs.59 It is important to recognize that the risk for adverse cardiovascular events associated with non-aspirin NSAIDs is predominately seen among people with pre-existing cardiovascular risk factors or disorders,60 and more recent literature has suggested that traditional non-aspirin NSAIDs might not be associated with an increased cardiovascular risk.61 Non-aspirin NSAIDs could therefore potentially be considered as chemoprevention agents in people with a low baseline risk for cardiovascular disease and a moderate-high baseline risk for colorectal cancer. An important observation within our study is that, despite two decades of high quality research, we are still unable to make strong recommendations on the use of chemoprevention agents for colorectal cancer, and most candidate agents previously studied have been shown to have no efficacy or are associated with excess harm. This is probably partly because of our inability to accurately stratify patients, both for benefits of chemoprevention and risks of treatment. As we enter a new era of personalized medicine and chemoprevention research, it will be important to focus on patient stratification according to genetic factors and variations, spectral biomarkers, and end target (such as cyclooxygenase-2) mucosal expression.62 63 64 This molecular phenotyping will help to optimize early proof of study intervention trials aimed at identifying candidate chemoprevention agents for use in routine practice. There are certain limitations in our study that merit further discussion. First, the greatest threat to the validity of a meta-analysis is conceptual heterogeneity in study designs, participants, interventions, or outcome assessments. We attempted to minimize this by applying rigorous selection criteria during the design phase of our study, standardizing data abstraction, contacting study authors for missing data, and performing several sensitivity analyses to assess the robustness of our findings. Second, over-exposure or under-exposure to the study agents (relative to protocol assignment) varied across trials, and the impact of compliance on our estimates could not be accurately quantified. There was variability in timing of outcome assessment, which could not be accounted for in our analysis, and sufficient data were not available to perform time-to-event analysis and calculate hazard ratios. Third, because of the relatively short duration of analyzed trials, the risk of colorectal cancer was low, precluding quantitative assessment of efficacy for preventing colorectal cancer. Advanced neoplasia, however, is strong predictor of future colorectal cancer, and prevention of advanced metachronous neoplasia will therefore probably result in a reduced incidence of colorectal cancer. Fourth, the definition of serious adverse events was not uniform across trials and not consistent with regulatory definition, and, despite attempts to standardize this during data abstraction, we might not have completely captured serious adverse events associated with all agents. Fifth, studies were conducted over a wide time period. With improvements in colonoscopy equipment and a greater understanding of quality metrics to augment the rate of detection of neoplasia, it is possible that detection rates could have varied over time. Within these randomized controlled trials with meticulous colonoscopic exams, however, we did not observe any significant time dependent increase in detection rates in the placebo arms of trials. Finally, efficacy of chemoprevention agents for preventing serrated neoplasia could not be estimated because of a paucity of data on this endpoint. In conclusion, among people with previously resected colorectal neoplasia, non-aspirin NSAIDs are effective for the prevention of advanced metachronous neoplasia over a three to five year period, but the risk:benefit profile potentially favors use only in those with a history of high risk neoplasia. After non-aspirin NSAIDs, low dose aspirin alone has the second highest probability of being most effective for preventing advanced metachronous neoplasia and, with its favorable risk:benefit profile, could be considered as an agent for chemoprevention of secondary colorectal cancer in a select group of patients. Shared decision making with a thorough understanding of patients’ values and preferences in the context of risks and benefits of each agent would be helpful. Additionally, given the low confidence in several estimates, molecular phenotyping and precision chemoprevention trials are needed to determine how people can be optimally risk stratified according to safety of treatment and likelihood of response. Contributors: PSD and SS contributed equally to the manuscript and were responsible for study concept and design. PSD, SS, EM, and LJP acquired the data. PSD, SS, RK, SG, and MHM analyzed and interpreted the data. PSD, SS, and EM drafted the manuscript, which was critically revised for important intellectual content by SS, RK, LJP, PJL, SG, and MHM. All authors approved the final manuscript. SS supervised the study and is guarantor. Competing interests: All authors have completed the ICMJE uniform disclosure form at www.icmje.org/coi_disclosure.pdf and declare: PSD and EM are supported by the NIDDK training grant 5T32DK007202. SS is supported by the NIH/NLM training grant T15LM011271 and the American College of Gastroenterology junior faculty development award. SG is partly supported by NCI 2 U54CA132379-06A1, as well as merit review award No 1 I01 HX001574-01A1 from the US Department of Veterans Affairs Health Services Research and Development Service of the VA Office of Research and Development. The views expressed in this article are those of the author(s) and do not necessarily represent the views of the Department of Veterans Affairs. Data sharing: Technical appendix, statistical code, and dataset available from the corresponding author. Ferlay J, Soerjomataram I, Dikshit R, et al. Cancer incidence and mortality worldwide: sources, methods and major patterns in GLOBOCAN 2012. Int J Cancer2015;136:E359-86. doi:10.1002/ijc.29210 pmid:25220842. Mariotto AB, Yabroff KR, Shao Y, Feuer EJ, Brown ML. Projections of the cost of cancer care in the United States: 2010-2020. J Natl Cancer Inst2011;103:117-28. doi:10.1093/jnci/djq495 pmid:21228314. Brenner H, Kloor M, Pox CP. Colorectal cancer. Lancet2014;383:1490-502. doi:10.1016/S0140-6736(13)61649-9 pmid:24225001. Nishihara R, Wu K, Lochhead P, et al. Long-term colorectal-cancer incidence and mortality after lower endoscopy. N Engl J Med2013;369:1095-105. doi:10.1056/NEJMoa1301969 pmid:24047059. Brenner H, Stock C, Hoffmeister M. Effect of screening sigmoidoscopy and screening colonoscopy on colorectal cancer incidence and mortality: systematic review and meta-analysis of randomised controlled trials and observational studies. BMJ2014;348:g2467. doi:10.1136/bmj.g2467 pmid:24922745. Schreuders EH, Ruco A, Rabeneck L, et al. Colorectal cancer screening: a global overview of existing programmes. Gut2015;64:1637-49. doi:10.1136/gutjnl-2014-309086 pmid:26041752. Singh S, Singh PP, Murad MH, Singh H, Samadder NJ. Prevalence, risk factors, and outcomes of interval colorectal cancers: a systematic review and meta-analysis. Am J Gastroenterol2014;109:1375-89. doi:10.1038/ajg.2014.171 pmid:24957158. Adler J, Robertson DJ. Interval Colorectal Cancer After Colonoscopy: Exploring Explanations and Solutions. Am J Gastroenterol2015;110:1657-64, quiz 1665. doi:10.1038/ajg.2015.365 pmid:26553207. Arber N, Eagle CJ, Spicak J, et al. PreSAP Trial Investigators. Celecoxib for the prevention of colorectal adenomatous polyps. N Engl J Med2006;355:885-95. doi:10.1056/NEJMoa061652 pmid:16943401. Baron JA, Barry EL, Mott LA, et al. A Trial of Calcium and Vitamin D for the Prevention of Colorectal Adenomas. N Engl J Med2015;373:1519-30. doi:10.1056/NEJMoa1500409 pmid:26465985. Baron JA, Beach M, Mandel JS, et al. Calcium Polyp Prevention Study Group. Calcium supplements for the prevention of colorectal adenomas. N Engl J Med1999;340:101-7. doi:10.1056/NEJM199901143400204 pmid:9887161. Baron JA, Cole BF, Sandler RS, et al. A randomized trial of aspirin to prevent colorectal adenomas. N Engl J Med2003;348:891-9. doi:10.1056/NEJMoa021735 pmid:12621133. Benamouzig R, Deyra J, Martin A, et al. Daily soluble aspirin and prevention of colorectal adenoma recurrence: one-year results of the APACC trial. Gastroenterology2003;125:328-36. doi:10.1016/S0016-5085(03)00887-4 pmid:12891533. Bertagnolli MM, Eagle CJ, Zauber AG, et al. APC Study Investigators. Celecoxib for the prevention of sporadic colorectal adenomas. N Engl J Med2006;355:873-84. doi:10.1056/NEJMoa061355 pmid:16943400. Bonithon-Kopp C, Kronborg O, Giacosa A, Räth U, Faivre J. European Cancer Prevention Organisation Study Group. Calcium and fibre supplementation in prevention of colorectal adenoma recurrence: a randomised intervention trial. Lancet2000;356:1300-6. doi:10.1016/S0140-6736(00)02813-0 pmid:11073017. Chu DZ, Hussey MA, Alberts DS, et al. Colorectal Chemoprevention Pilot Study (SWOG-9041), randomized and placebo controlled: the importance of multiple luminal lesions. Clin Colorectal Cancer2011;10:310-6. doi:10.1016/j.clcc.2011.06.005 pmid:21782524. Cole BF, Baron JA, Sandler RS, et al. Polyp Prevention Study Group. Folic acid for the prevention of colorectal adenomas: a randomized clinical trial. JAMA2007;297:2351-9. doi:10.1001/jama.297.21.2351 pmid:17551129. Ishikawa H, Mutoh M, Suzuki S, et al. The preventive effects of low-dose enteric-coated aspirin tablets on the development of colorectal tumours in Asian patients: a randomised trial. Gut2014;63:1755-9. doi:10.1136/gutjnl-2013-305827 pmid:24488498. Logan RF, Grainge MJ, Shepherd VC, Armitage NC, Muir KR. ukCAP Trial Group. Aspirin and folic acid for the prevention of recurrent colorectal adenomas. Gastroenterology2008;134:29-38. doi:10.1053/j.gastro.2007.10.014 pmid:18022173. Meyskens FL Jr, , McLaren CE, Pelot D, et al. Difluoromethylornithine plus sulindac for the prevention of sporadic colorectal adenomas: a randomized placebo-controlled, double-blind trial. Cancer Prev Res (Phila)2008;1:32-8. doi:10.1158/1940-6207.CAPR-08-0042 pmid:18841250. Pommergaard HC, Burcharth J, Rosenberg J, Raskov H. Aspirin, Calcitriol, and Calcium Do Not Prevent Adenoma Recurrence in a Randomized Controlled Trial. Gastroenterology2016;150:114-122.e4. doi:10.1053/j.gastro.2015.09.010 pmid:26404953. Sandler RS, Halabi S, Baron JA, et al. A randomized trial of aspirin to prevent colorectal adenomas in patients with previous colorectal cancer. N Engl J Med2003;348:883-90. doi:10.1056/NEJMoa021633 pmid:12621132. Wu K, Platz EA, Willett WC, et al. A randomized trial on folic acid supplementation and risk of recurrent colorectal adenoma. Am J Clin Nutr2009;90:1623-31. doi:10.3945/ajcn.2009.28319 pmid:19864409. Cole BF, Logan RF, Halabi S, et al. Aspirin for the chemoprevention of colorectal adenomas: meta-analysis of the randomized trials. J Natl Cancer Inst2009;101:256-66. doi:10.1093/jnci/djn485 pmid:19211452.
Cooper K, Squires H, Carroll C, et al. Chemoprevention of colorectal cancer: systematic review and economic evaluation. Health Technol Assess2010;14:1-206. doi:10.3310/hta14320 pmid:20594533. Rostom A, Dubé C, Lewin G, et al. U.S. Preventive Services Task Force. Nonsteroidal anti-inflammatory drugs and cyclooxygenase-2 inhibitors for primary prevention of colorectal cancer: a systematic review prepared for the U.S. Preventive Services Task Force. Ann Intern Med2007;146:376-89. doi:10.7326/0003-4819-146-5-200703060-00010 pmid:17339623. Cipriani A, Higgins JP, Geddes JR, Salanti G. Conceptual and technical challenges in network meta-analysis. Ann Intern Med2013;159:130-7. doi:10.7326/0003-4819-159-2-201307160-00008 pmid:23856683. Mills EJ, Ioannidis JP, Thorlund K, Schünemann HJ, Puhan MA, Guyatt GH. How to use an article reporting a multiple treatment comparison meta-analysis. JAMA2012;308:1246-53. doi:10.1001/2012.jama.11228 pmid:23011714. Lu G, Ades AE. Combination of direct and indirect evidence in mixed treatment comparisons. Stat Med2004;23:3105-24. doi:10.1002/sim.1875 pmid:15449338. Puhan MA, Schünemann HJ, Murad MH, et al. GRADE Working Group. A GRADE Working Group approach for rating the quality of treatment effect estimates from network meta-analysis. BMJ2014;349:g5630. doi:10.1136/bmj.g5630 pmid:25252733. Hutton B, Salanti G, Caldwell DM, et al. The PRISMA extension statement for reporting of systematic reviews incorporating network meta-analyses of health care interventions: checklist and explanations. Ann Intern Med2015;162:777-84. doi:10.7326/M14-2385 pmid:26030634. Hoaglin DC, Hawkins N, Jansen JP, et al. Conducting indirect-treatment-comparison and network-meta-analysis studies: report of the ISPOR Task Force on Indirect Treatment Comparisons Good Research Practices: part 2. Value Health2011;14:429-37. doi:10.1016/j.jval.2011.01.011 pmid:21669367. Wolff WI. Colonoscopy: history and development. Am J Gastroenterol1989;84:1017-25.pmid:2672788. Bertagnolli MM, Eagle CJ, Zauber AG, et al. Adenoma Prevention with Celecoxib Study Investigators. Five-year efficacy and safety analysis of the Adenoma Prevention with Celecoxib Trial. Cancer Prev Res (Phila)2009;2:310-21. doi:10.1158/1940-6207.CAPR-08-0206 pmid:19336730. Arber N, Spicak J, Rácz I, et al. Five-year analysis of the prevention of colorectal sporadic adenomatous polyps trial. Am J Gastroenterol2011;106:1135-46. doi:10.1038/ajg.2011.116 pmid:21503000. Chu DZ, Chansky K, Alberts DS, et al. Adenoma recurrences after resection of colorectal carcinoma: results from the Southwest Oncology Group 9041 calcium chemoprevention pilot study. Ann Surg Oncol2003;10:870-5. doi:10.1245/ASO.2003.03.037 pmid:14527904. Lieberman DA, Rex DK, Winawer SJ, Giardiello FM, Johnson DA, Levin TR. United States Multi-Society Task Force on Colorectal Cancer. Guidelines for colonoscopy surveillance after screening and polypectomy: a consensus update by the US Multi-Society Task Force on Colorectal Cancer. Gastroenterology2012;143:844-57. doi:10.1053/j.gastro.2012.06.001 pmid:22763141. Higgins JPT Green S, ed. Cochrane Handbook for Systematic Reviews of Interventions. Cochrane Collaboration, 2011. http://www.handbook.cochrane.org. Brenner H, Altenhofen L, Stock C, Hoffmeister M. Natural history of colorectal adenomas: birth cohort analysis among 3.6 million participants of screening colonoscopy. Cancer Epidemiol Biomarkers Prev2013;22:1043-51. doi:10.1158/1055-9965.EPI-13-0162 pmid:23632815. DerSimonian R, Laird N. Meta-analysis in clinical trials. Control Clin Trials1986;7:177-88. doi:10.1016/0197-2456(86)90046-2 pmid:3802833. Higgins JP, Thompson SG, Deeks JJ, Altman DG. Measuring inconsistency in meta-analyses. BMJ2003;327:557-60. doi:10.1136/bmj.327.7414.557 pmid:12958120. Hartung J, Knapp G. A refined method for the meta-analysis of controlled clinical trials with binary outcome. Stat Med2001;20:3875-89. doi:10.1002/sim.1009 pmid:11782040. Dias S, Sutton AJ, Ades AE, Welton NJ. Evidence synthesis for decision making 2: a generalized linear modeling framework for pairwise and network meta-analysis of randomized controlled trials. Med Decis Making2013;33:607-17. doi:10.1177/0272989X12458724 pmid:23104435. Khera R, Murad MH, Chandar AK, et al. Association of Pharmacological Treatments for Obesity With Weight Loss and Adverse Events: A Systematic Review and Meta-analysis. JAMA2016;315:2424-34. doi:10.1001/jama.2016.7602 pmid:27299618. Gelman ARD. Inference from iterative simulation using multiple sequences. Stat Sci1992;7:457-511doi:10.1214/ss/1177011136. Salanti G, Ades AE, Ioannidis JP. Graphical methods and numerical summaries for presenting results from multiple-treatment meta-analysis: an overview and tutorial. J Clin Epidemiol2011;64:163-71. doi:10.1016/j.jclinepi.2010.03.016 pmid:20688472. Chaimani A, Higgins JP, Mavridis D, Spyridonos P, Salanti G. Graphical tools for network meta-analysis in STATA. PLoS One2013;8:e76654. doi:10.1371/journal.pone.0076654 pmid:24098547. Zhang J, Yu KF. What’s the relative risk? A method of correcting the odds ratio in cohort studies of common outcomes. JAMA1998;280:1690-1. doi:10.1001/jama.280.19.1690 pmid:9832001. Singh S, Khera R, Allen AM, Murad MH, Loomba R. Comparative effectiveness of pharmacological interventions for nonalcoholic steatohepatitis: A systematic review and network meta-analysis. Hepatology2015;62:1417-32. doi:10.1002/hep.27999 pmid:26189925. Martínez ME, Baron JA, Lieberman DA, et al. A pooled analysis of advanced colorectal neoplasia diagnoses after colonoscopic polypectomy. Gastroenterology2009;136:832-41. doi:10.1053/j.gastro.2008.12.007 pmid:19171141. Chan AT, Ladabaum U. Where Do We Stand With Aspirin for the Prevention of Colorectal Cancer? The USPSTF Recommendations. Gastroenterology2016;150:14-8. doi:10.1053/j.gastro.2015.11.018 pmid:26602220. Chubak J, Kamineni A, Buist DSM, et al. U.S. Preventive Services Task Force Evidence Syntheses, formerly Systematic Evidence Reviews. Aspirin Use for the Prevention of Colorectal Cancer: An Updated Systematic Evidence Review for the US Preventive Services Task Force. Rockville (MD).Agency for Healthcare Research and Quality, 2015. Johnson MR, Grubber J, Grambow SC, et al. Physician Non-adherence to Colonoscopy Interval Guidelines in the Veterans Affairs Healthcare System. Gastroenterology2015;149:938-51. doi:10.1053/j.gastro.2015.06.026 pmid:26122143. Murphy CC, Lewis CL, Golin CE, Sandler RS. Underuse of surveillance colonoscopy in patients at increased risk of colorectal cancer. Am J Gastroenterol2015;110:633-41. doi:10.1038/ajg.2014.344 pmid:25384901. Mysliwiec PA, Brown ML, Klabunde CN, Ransohoff DF. Are physicians doing too much colonoscopy? A national survey of colorectal surveillance after polypectomy. Ann Intern Med2004;141:264-71. doi:10.7326/0003-4819-141-4-200408170-00006 pmid:15313742. Patel N, Tong L, Ahn C, Singal AG, Gupta S. Post-polypectomy Guideline Adherence: Importance of Belief in Guidelines, Not Guideline Knowledge or Fear of Missed Cancer. Dig Dis Sci2015;60:2937-45. doi:10.1007/s10620-015-3685-x pmid:25947332. Mainous AG, Tanner RJ, Shorr RI, Limacher MC. Use of aspirin for primary and secondary cardiovascular disease prevention in the United States, 2011-2012. J Am Heart Assoc2014;3:e000989. doi:10.1161/JAHA.114.000989. pmid:25023071. Stafford RS, Monti V, Ma J. Underutilization of aspirin persists in US ambulatory care for the secondary and primary prevention of cardiovascular disease. PLoS Med2005;2:e353. doi:10.1371/journal.pmed.0020353 pmid:16277554. Rostom A, Dube C, Lewin GUS. Preventive Services Task Force Evidence Syntheses, formerly Systematic Evidence Reviews. Use of Aspirin and NSAIDs to Prevent Colorectal Cancer. Rockville (MD).Agency for Healthcare Research and Quality, 2007. McGettigan P, Henry D. Cardiovascular risk and inhibition of cyclooxygenase: a systematic review of the observational studies of selective and nonselective inhibitors of cyclooxygenase 2. JAMA2006;296:1633-44. doi:10.1001/jama.296.13.jrv60011 pmid:16968831. Bello AE, Holt RJ. Cardiovascular risk with non-steroidal anti-inflammatory drugs: clinical implications. Drug Saf2014;37:897-902. doi:10.1007/s40264-014-0207-2 pmid:25079141. Drew DA, Cao Y, Chan AT. Aspirin and colorectal cancer: the promise of precision chemoprevention. Nat Rev Cancer2016;16:173-86. doi:10.1038/nrc.2016.4 pmid:26868177. Nan H, Hutter CM, Lin Y, et al. CCFR GECCO. Association of aspirin and NSAID use with risk of colorectal cancer according to genetic variants. JAMA2015;313:1133-42. doi:10.1001/jama.2015.1815 pmid:25781442. Roy HK, Turzhitsky V, Wali R, et al. Spectral biomarkers for chemoprevention of colonic neoplasia: a placebo-controlled double-blinded trial with aspirin. Gut2015;gutjnl-2015-309996. doi:10.1136/gutjnl-2015-309996. pmid:26503631.